There are times, as I am immersed in my Bible, when I get those "Aha" moments and I feel like God has opened a direct line of communication from His throne to my brain. Other times it is my heart or my spirit that nudges me to take another moment to meditate on that verse because I just know there is something more to glean. If you've been reading this blog for awhile you know that I love the history of God's relationship with His chosen people in the Old Testament. There is much there for us to learn because God never changes. He is a God of order, and I believe He has set a standard by which He operates, and He does not waver from it. In essence, that means He does not break His own rules, and is faithful to what I call His "Spiritual Mechanics". All this is to set up a nugget of revelation that my husband pointed out in Exodus, Chapter 33. I want to preface this blog post, by saying this is my opinion, and there are many facets to the following discussion, and I cannot address them all in this one post. I know there will be differing opinions, and that's okay. Our God is pleased when we come seeking knowledge of Him, and He is not condemning when we are seeking Him from a faithful heart. Here is the setup: In Chapter 32, the Israelites had broken a couple of those rules, which we call commandments, that God had established when He brought them out of the Land of Egypt ... You shall have no other Gods before Me, and You shall not make for yourself any idol. But while Moses was visiting with God on Mount Sinai, the Israelites became concerned because he was delayed. Worrying that something might have happened to him, they pleaded with Aaron to help them make a Golden Calf; an idol that could go before them and lead them. We know the consequences of that act ... YHWH was angered and determined to destroy the Israelites (Exodus 32:10) until Moses interceded upon their behalf. Yet, three thousand were slain that day because they refused to consecrate themselves to the Lord (Exodus 32:26-28). Now, here is the nugget that was revealed to me: In Chapter 33, YHWH tells Moses that He is going to send an angel before the Israelites as they enter the Promised Land and drive out the idolators who inhabit the Land [the Canaanites, Amorites, Hittites, Perizites, Hivites, and Jebusites] because if He went, Himself, He would destroy them. Once again, Moses intercedes for the children of Israel and reminds God that He has told him he [Moses] has found grace in His sight. Moses asks to know who will accompany them, and YHWH says , "My presence shall go with thee". So what does this tell us? Several things. First, God hates idolatry and sin so much He is willing to blot us out of the Book of Life (the list of those who will inherit eternal life and live with God in heaven forever). SIDE NOTE: Now, I know that there will be those who say Jesus fixed that problem by taking on the punishment that is due us. And you can find commentaries that support the belief that Ephesians 1:3-6 says that God chose us from the foundation of the world and predestined for us to be adopted as children of God, so if your name is written in the Book of Life, it cannot be blotted out. My personal opinion is that these verses show the heart of God and that is was His plan and purpose that all would remain in Christ according to the grace He has given us in Christ. BUT THEN, there is the verse in Revelation 3:5, when Jesus is addressing the Churches ... He who overcomes [the world through believing that Jesus is the Son of God] will accordingly be dressed in white clothing; and I will never blot out his name from the Book of Life, and I will confess and openly acknowledge his name before My Father and before His angels [saying that he is one of Mine]. Various translations record those first few words as, "He who conquers", or "The victor". Either way -- whether you are an overcomer, a conqueror, or a victor, there is a suggestion that there is a battle; a fight that might possibly result in your name being blotted out. The very concepts of overcoming, conquering and winning alludes to repentance of sin in one's life. And repentance is an ongoing activity in the life of a Believer. If it is a foregone conclusion that God chose us and predestined us [with no decision on our part for failure], then why would Jesus even need to present the option of blotting out a name? Could unrepented sin be the causal factor? Okay, back to my original premise ... God tells Moses that He is sending "an angel" before the nation of Israel to drive out the native inhabitants [who are idolators] because ,if He went Himself, He was so angry, He would destroy His chosen people. Later, he relents when Moses asks for mercy and God says, "My presence shall go with thee". I believe we should understand this "angel" and "presence" to be Jesus. For me, this is a picture of the Nature of God. He maintained His Holy standard of no other gods, and no idols, by refusing to accompany them Himself -- while exhibiting His attribute of Mercy by sending His presence with them. It is also a picture of His Grace. He never relents on his hatred of idolatry and sin, yet provides a way for us to remain in His presence, even when we sin [repentance]. In this Old Testament picture, it is through the angel who goes before them, which is a picture of Christ in the New Testament. From this nugget of revelation I received this week, I can know that I serve a God who never changes. There is no God of the Old Testament who is different from the God of the New Testament -- it is the same God ... the One who is at the same time Holy [maintaining His righteous standards], yet also Merciful and full of Grace. He is a God who commands us to be holy and righteous as He is, for we are made in His image. And we need to understand that there will come a day when we will stand before our Savior, and in order to not be blotted out of the Book of Life we must overcome this world. We know that some of will succeed, some will fail, and some will fall away. It is not God's will that He lose anyone, just as it was not His desire that the Israelites accept Him as their God and then fall victim to idolatry and sin. Are we any different? There is a very important lesson to learn from this Biblical example. The same concept of our God is presented in Exodus as is represented in Revelation. Do not let us think that we are beyond the temptations of those ancient Chosen People. We are to walk out our salvation with fear and trembling ... lest we stumble and fall away. 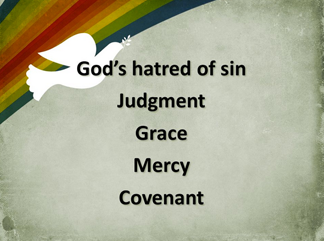 If we see only God's attributes of Mercy and Grace, and ignore His Righteousness and Holiness [which includes His Judgment], we run the risk of becoming complacent and spewed out of His mouth. We serve a Mighty God, who reveals Himself day by day to those who seek Him! 1 Corinthians 10:12 "Therefore let the one who thinks he stands firm [immune to temptation, being overconfident and self-righteous], take care that he does not fall [into sin and condemnation]".